Are Australia's Koalas, Battling Climate Change and Chlamydia, on the Path to Extinction? (SYDNEY)  Although they appear on just about every Australian postcard, koala bears are actually quite hard to spot in the wild, where their numbers are gradually declining. Scientists are now sounding the alarm  and urging Australia's Senate to declare the iconic, sleepy-eyed marsupials an endangered species. Scientists estimate Australia's koala population at somewhere between 50,000 and 100,000. "We cannot be totally sure because we don't receive enough public subsidies to thoroughly study the subject. But it is clear that the number is dropping," says Alistair Melzer, a senior researcher at Queensland University. In the Gold Coast region, the number of koala bears seems to have decreased by as much as 80% since the 1990s. There are several factors that might be pushing koala bears close to extinction. Topping the list are urbanization and farming, which have destroyed the cuddly creature's natural habitats. For both food and shelter, koalas rely on large eucalyptus trees that grow only in specific places. "Unfortunately, the places where koala bears thrive are also the best spots for human beings, namely places with fertile soil," says Melzer. Koalas are in real trouble when their habitats shrink and they have no other choice but to live near cities. Proximity to humans can mean attacks by domestic dogs or fatal run-ins with automobiles. Moreover, the tree-dwelling animals suffer from heat waves and drought, which are likely to be more frequent because of climate change. 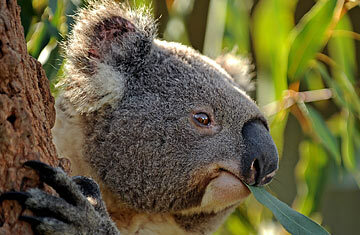 Koala bears cannot cope with high temperatures, and they need to get moisture from eucalyptus leaves. "If climate-change predictions play out, koala bears won't migrate to the south, where temperatures are lower. As a result, they will just die," says Melzer. Finally, koalas suffer frequently from chlamydia, a bacterium. "This is yet another among a multitude of threats that koala bears have to face," says Mathew Crowther, a biologist at the University of Sydney. But while scientists agree that the koala could eventually die out, the Australian government has not yet recognized the animal as an endangered species. Each Australian state has its own list of endangered species. In New South Wales, the koala bear is listed as "vulnerable" statewide, whereas in Queensland, the species is considered to be at risk only in certain specific areas. Scientists say it's time the government create a national endangered-species list. "That is a vicious cycle," says Melzer. "The government has not listed the koala bear as an endangered species because it lacks precise figures. But we don't have enough public subsidies to carry out long-term research." To make things even more complicated, there are some areas where the koala population has actually not decreased. That's the case for South Australia, were the animals have been reintroduced in certain areas. But that too poses potential problems for the species, according to Melzer. "Koalas had almost disappeared in those regions. Only koalas from a narrow segment of the overall population were reintroduced there. As a result, there is no genetic diversity," he says. The koala issue is now being examined by a special Senate committee, which is expected to issue a recommendation by August whether or not to list the animals as endangered. "If the koala bear is listed as an endangered species, it will be good not only for this particular species but also for others that share the same habitats," says Crowther. See 12 Bizarre Animal Friendships. See "Saving the World's Endangered Species."